Does your social circle bias your view of the world? You know who your friends are. You have common interests with them as well as some things you disagree about, and they’re the ones who respond to your texts, tweets and Facebook posts. You know how you compare to the Joneses next door, but what about to the rest of the neighborhood? It turns out that, based on extensive research by Dr. Mirta Galesic and other social psychologists, most people tend to be more similar to their social circle than to the general population, and this influences their views of others’ experiences. In other words, our limited social experiences affect how we perceive other people. According to Dr. Mirta Galesic, one’s social circle affects one’s views and assessments of the general population. Mirta Galesic, now the Cowan Chair in Human Social Dynamics at the Santa Fe Institute in New Mexico, previously worked at the Max Planck Institute for Human Development in Berlin, Germany, and earned her Ph.D. in Croatia. She has lived and worked in a variety of places and accrued experience working with researchers around the world. Many psychologists pry into the human mind, while many social scientists ask the question, “What is in the environment?” Galesic’s approach seeks to combine these viewpoints by both exploring the mind and environmental influences on social behavior as well as the complex interactions between them. She attempts to navigate the difficult path between nature and nurture. Focusing only on the mind when studying human cognition only tells part of the story, according to Galesic. Over the course of decades of research on human cognition, social psychologists have identified and coined more and more biases in how we interpret social interactions and the wider world. As Galesic put it, every year a researcher announces, “Oh, I’ve discovered a new bias!” Some of the biases seem contradictory too, such as false consensus and false uniqueness, where one overestimates how one’s views are similar to others’ or how unique they are. Galesic’s recent research, which she presented to us in a fascinating lecture at the Santa Fe Institute on Monday, includes too opposing biases. She refers to the first one, self-enhancement, as the “Lake Wobegon effect,” which refers to the amusingly optimistic motto in Prairie Home Companion, where “all the women are strong, all the men are good-looking, and all the children are above average.” The glass is at least half full. Steve Loughnan, a social psychologist at University of Edinburgh, has observed this effect in his independent research as well. In 2011, he found greater self-enhancement “in societies with more income inequality, and income inequality predicted cross-cultural differences in self-enhancement better than did individualism/collectivism.” In contrast, however, sometimes people exhibit the opposite, self-depreciation bias, in which one pessimistically believes that they or their group is below average. This tends to happen when one imagines that one is worse than others with apparently difficult tasks, where success is relatively rare. (How do your skills compare when it comes to understanding calculus or cooking a souffle?) Moreover, some people appear to be “unskilled and unaware of it,” according to University of Michigan professor Katherine Burson. In two recent studies, Galesic collaborated with Henrik Olsson, a colleague at her former institute in Berlin, and Jörg Riesskamp, a psychologist at the University of Basel, Switzerland. They published their research on Dutch, German, and US populations in Psychological Science and Cognitive Science Society Proceedings. They start with the well-known observation of “homophily,” in which interactions between like-minded individuals creates a tendency for people to associate with others similar to themselves, for example with respect to socioeconomic status and ideology. 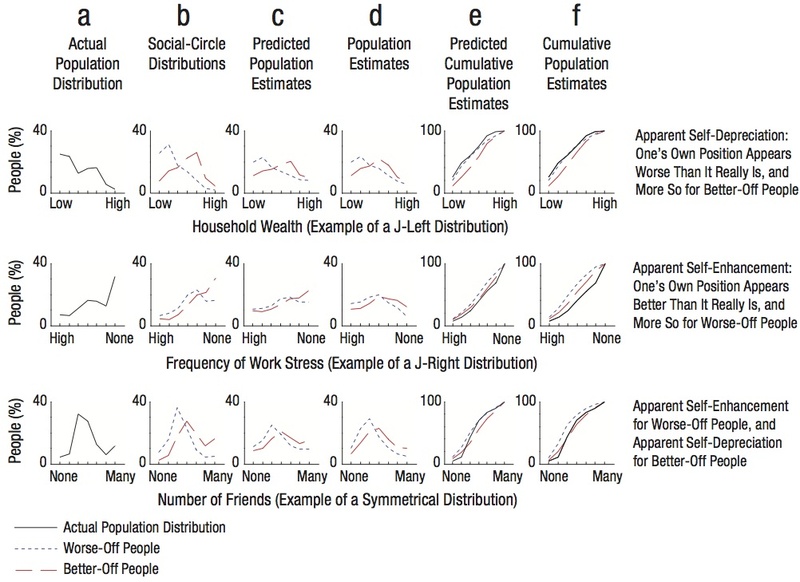 Galesic and her co-workers perform a rigorous statistical analysis of thousands of randomly selected respondents with a “social sampling model,” in which people infer how others are doing by sampling from their own immediate social environments. Galesic, Olsson & Riesskamp (2012): self-enhancement and self-depreciation in people’s estimates of household wealth, work stress, and number of friends in their social circles and general population. It turns out that, as Galesic concludes, that “people are well attuned to their immediate social environments but not as well to broader society.” For example, people exhibit self-enhancement when it comes to work stress: they view their own position as better than it really is, especially for those who experience relatively high levels of stress. On the other hand, people have an apparent self-depreciation with respect to household wealth, in which one’s position appears worse than it really is, especially those who are better off. Both effects could be explained by Galesic’s model, which appears to demonstrate that a more complete picture of the nature of human cognition requires understanding people’s inference processes and their environments. Although knowing one’s social circle does not translate into accurate knowledge of characteristics of the general population, with which they have less contact, that is not necessarily a problem especially if one is aware of the effect. In addition, one can attempt to reduce that bias by enlarging and diversifying one’s social circle. Galesic herself described how, since moving to the US last year, she has been trying to immerse herself in a wide range of social and political environments and expose herself to a variety of news sources, even going so far as to include Fox News and Sean Hannity. One can imagine important and interesting implications of this research, which Galesic outlined at the end of her presentation. For example, since beliefs travel through social networks, one might encourage support or awareness about particular policies through them. One could communicate important information, such as about medical screenings and vaccines, since “systematic peer-to-peer diffusion might be more effective.” Moreover, the differences between people’s immediate social circles and the larger society highlight the importance of encouraging diversity in neighborhoods and workplaces, communicating with people with different views, and the benefits of immersion in different communities.